GEA has built a whole milk drying plant for Fonterra in earthquake zone Pahiatua in New Zealand that produces at 15 tons/hour and is designed to withstand a 1/2500-year event without damage. How different would this facility be built from non-earthquake zones? What other considerations should plant owners have when building facilities? What would a facility look like in the future? Chris Burt, GEA’s engineering manager in New Zealand tells Food News International. FNI: How different is designing and building an earthquake-resistant facility different from one that is not? Burt: All industrial buildings are designed to withstand the forces to which they are likely to be subjected. In New Zealand, seismic forces are dominant and designers need to consider the seismic coefficients of each part of the building. In the case of the whole milk powder factory at Pahiatua, the location and the height of the building meant that the strength of the building, and therefore the amount of material required to meet the seismic threat, was becoming impractical. It was possible to meet the required specification by using the base isolation technique described. The tallest parts of the building were protected with base isolation. This meant that the seismic coefficient of those areas was reduced by approximately 60% as they would be subjected to much lower forces from any seismic activity, as the building would be allowed to move by up to 900mm laterally. FNI: What considerations did the GEA team have when designing the facility? Burt: The GEA team had to decide whether it was both necessary and feasible to build a base isolated factory. It then had to consider which parts of the construction had to be base isolated taking into account practicality and economics. The greatest benefit from base isolation is gained in the tallest structures. FNI: What challenges did the GEA team overcome? Burt: A major challenge was bringing essential services into the base isolated areas, which are designed to move by up to 900 mm laterally, from rigid buildings outside the base isolated areas. About 60 flexible supply lines had to be developed: carbon steel steam lines, lines for chemicals, product and electrical cables, all operating in a seismic loop that would not fail even under the most violent tremors anticipated. Similarly drain connections had to be designed to accommodate the movement or to fail in a designated safe location. Services that would normally be fed under the floor of the factory had to be re-routed to avoid fouling the base isolation system. FNI: What considerations are there for building facilities that are prone to natural forces such as floods and typhoons? Burt: All buildings are designed to meet the highest anticipated load conditions. In New Zealand the highest anticipated load comes from seismic activity. In other countries the highest loads might be, for example, from extreme wind conditions. The design principles are similar. FNI: How are facilities built to withstand natural disasters and human sabotage? Burt: While protecting against natural disasters is described above, plants also need to protect against accidents and sabotage. Companies need to ensure that plants are built to meet the requirements of all relevant codes of practice and that sufficient quality control testing is in place. This prevents a security breach or identifies a problem should one occur as early as possible and certainly before product leaves the factory. As part of this process, it is essential for companies to develop a robust food safety culture in which all employees understand the rules and systems in place and both respect and value them. Facilities also need to be located as close as possible to their sources of supply of both raw materials and labor. Robust health and safety policies are essential to keep the workforce safe and productive. FNI: How does technology and globalization affect the construction of a facility? Burt: The base isolation technology used at Pahiatua made the plant practicable. It would not have been economical to build such a large plant on that site otherwise. The latest design technology also allows engineers to work from three-dimensional models that make the building phase faster and more accurate. Wireless technology allows for a greater degree of remote working. 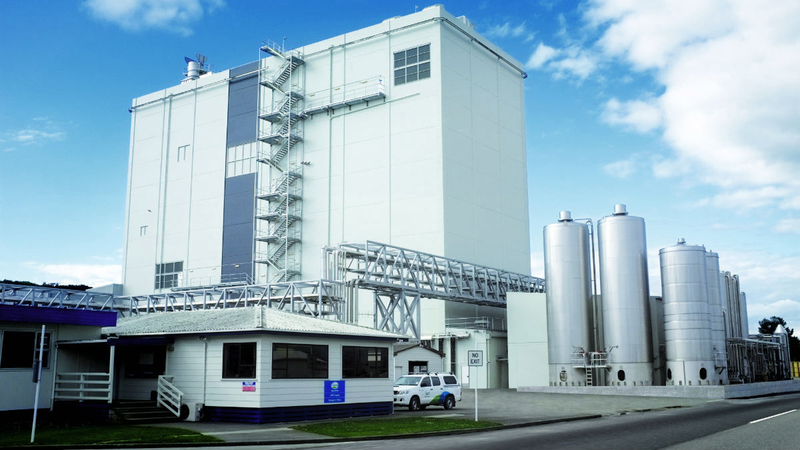 As New Zealand exports approximately 95% of the whole milk powder it produces, where it not for a global market the plant at Pahiatua would not exist. To meet the quality demands of that global market it is essential that any plant operates to the highest possible quality and hygiene standards. FNI: How would a facility of the future look like? Burt: The facilities of the future will continue to develop in energy efficiency and environmental sustainability. The plant at Pahiatua, for example, already produces more water than it uses by reprocessing ‘cow water’ into potable water that can be reused within the factory and, therefore, is not discharged into water courses. Further reducing the environmental impact of plants will be a primary concern for designers well into the future.